Review by AllTheBestFights.com: 2018-05-19, some good exchanges between Dominick Reyes and Jared Cannonier but it is not enough to get three stars: it gets two. The undefeated Dominick Reyes entered this fight with a perfect mma record of 8-0-0 (87% finishing rate) and he is ranked as the No.38 light heavyweight in the world. He fought four times last year winning over Marcus Govan, Jordan Powell, Joachim Christensen and Jeremy Kimball. Nick Roehrick. 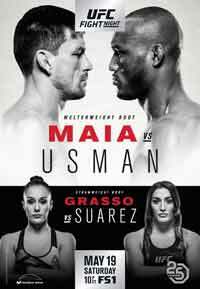 Reyes vs Cannonier is on the undercard of Demian Maia vs Kamaru Usman – UFC Fight Night 129. Watch the video and rate this fight! We are sorry, but since we have been contacted by “UFC – Zuffa”, we post only video highlights of the fight (as soon as we find it). If you have seen the full fight video you can rate it. THANKS!